From left, Chinese President Xi Jinping, Papua New Guinea's Prime Minister Peter O'Neill, Japanese Prime Minister Shinzo Abe, and U.S. Vice President Mike Pence wave as they pose for a group photo at APEC Haus in Port Moresby, Papua New Guinea, Nov. 18, 2018. ​It was the first time leaders had failed to agree on a declaration in 29 years of the Pacific Rim summits that involve countries representing 60 percent of the world economy. 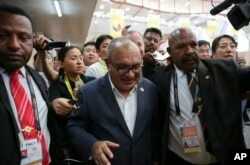 Papua New Guinea Prime Minister Peter O'Neill is escorted by security as he is pursued by reporters after reading his statement at the end of the APEC 2018 summit at Port Moresby, Papua New Guinea, Nov. 18, 2018. 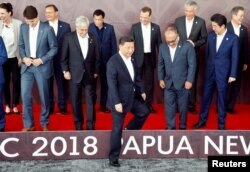 Leaders disperse after posing for a family photo ahead of the retreat session during the APEC Summit in Port Moresby, Papua New Guinea, Nov. 18, 2018. Leaders pose for a family photo at the APEC 2018 Economic Leaders Meeting at the APEC Haus at Port Moresby, Papua New Guinea, Nov. 18, 2018.